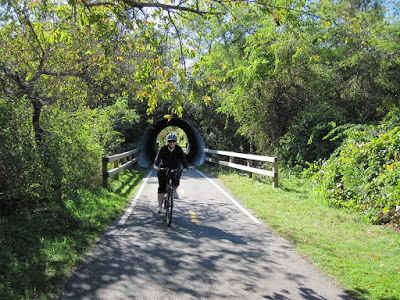 Last weekend we drove down to the Cape to ride on the Cape Cod Rail Trail. It’s about halfway up starting in South Dennis, although we parked at the Headwaters further down the road. It was about 80 miles from our house, according to google, and it really didn’t seem too long of a drive to me. We only made one wrong turn trying to find the entrance to Rt 3 in Boston – in typical fashion, no signage to lead you there. We parked by a cranberry bog (more on that later) and off we went, traveling by a few ponds before heading into the woods. The trail itself was fairly empty, it being October on the cape, and I think we brought the average age down a bit. It was a nice, sunny day and about 64 out, so just perfect. It’s a bit strange because you are on the Cape, but you don’t really know you are by the ocean at all. Most of the trail is in the woods, as you can see from the picture above. We made it all the way to Eastham, for a total ride of just over 23 miles. We made one detour to Skaket Beach, just to see the ocean, but it was really windy and kinda cold there, so I took a few pics and we kept going. We stopped for some food at a Taqueria on the trail that was really quite good – El Huapo’s in Brewster. Yum! It seemed like we were going uphill both ways, even though the trail was almost flat. The way back I think it was the wind in our face that did it. 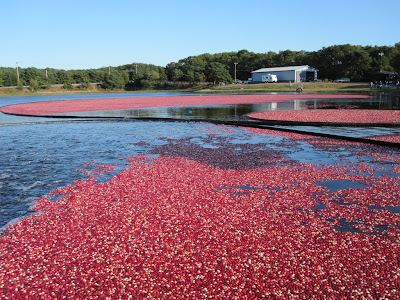 Once we made it back, I went and took some pictures of the cranberry harvest going on near where we parked. All in all, a fine way to spend a day.